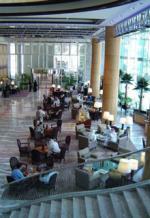 Discover all that Dubai has to offer with Taj Palace Hotel as a base. All 159 rooms at the hotel are well-appointed with necessary amenities to ensure that each guest's satisfaction. Modern comfort and convenience are seamlessly combined to ensure the guests' satisfaction. The hotel creates a balance of rich culture and modern convinience to ensure you a memorable stay. To proceed with this reservation at the Taj Palace Hotel please enter your visit dates and follow our secure online booking form.